Hi I´m Melissa West and Today´s Living Your Yoga is about Ayurveda, Yoga and Seasonal Transitions. 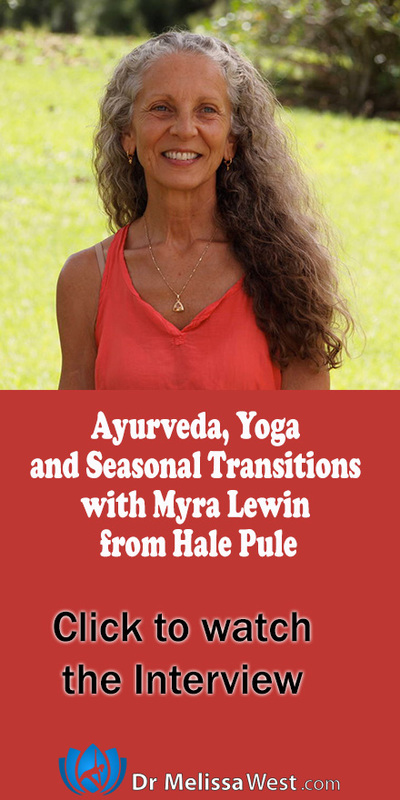 I´m joined today by Myra Lewin from Hale Pule Ayurveda and Yoga. 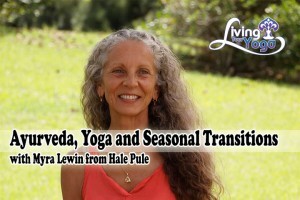 Hale Pule Ayurveda and Yoga is located on Kaua’i, Hawaii where they offer a space of healing to reconnect with your true self through trainings and retreats and their farm. Myra Lewin has spent the last two decades studying Ayurveda with some of the world´s most renowned teachers. Why don´t you start by telling us a little bit about Hale Pule and what you do there? One thing that really inspires me about your approach to Ayurveda is your ¨beyond the dosha¨ approach. Can you tell us more about that? How can we create balance through the seasonal transitions through our yoga and lifestyle practices? Today’s question to answer in the comments is: How do you support yourself through seasonal transitions? If you would like a nourishing soup for spring from Hale Pule´s blog with all of the six Ayurvedic tastes then click here. If you would like more support in transitioning into spring then I recommend our Seasonal Transition Videos in our Membership Community. We have one class tailored to bring harmony to each of the Ayurvedic constitutions: vata, pitta and kapha. Thank you so much for joining us Myra, it has been an honour to spend this time with you.